Torah is the one Hebrew word that may provide the best lens into the Jewish tradition. 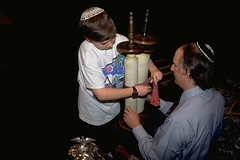 Meaning literally “instruction” or “guidebook,” the Torah is the central text of Judaism. It refers specifically to the five books of the Bible called the Pentateuch, traditionally thought to be penned by the early Hebrew prophet Moses. More generally, however, Torah applies to all of Jewish sacred literature, learning, and law. It is the Jewish way. According to the Jewish rabbinic tradition, the Torah is God’s blueprint for the creation of the universe. As such, all knowledge and wisdom is contained within it. One need only “turn it and turn it,” as the rabbis say in Pirkei Avot (Ethics of the Fathers) 5:25, to reveal its unending truth. Another classical rabbinic image of the Torah, taken from the Book of Proverbs 3:18, is that of a nourishing “tree of life,” a support and a salve to those who hold fast to it. Others speak of Torah as the expression of the covenant (brit) given by God to the Jewish people. Practically, Torah is the constitution of the Jewish people, the historical record of origins and the basic legal document passed down from the ancient Israelites to the present day. Torah provides the basis for the Jews’ relationship to God as well as their interactions as a socio-political cultural group. First recorded as an oral tradition and written in fragments, the Hebrew text of the five books of the Torah was edited over a period of centuries (generally thought to be from 1000 to 500 BCE), and canonized in its final form during subsequent generations. The first book, Bereshit, comes from the opening words of the text, “In the beginning.” A later Latin translation called it Genesis. This collection of texts contains the story of God’s creation of the world, the story of human origins, and the patriarchal narratives that comprise the story of Jewish origins. The subsequent four books are Shemot (“Names” or Exodus), Vayikrah (“And God called” or Leviticus), Bamidbar (“In the desert” or Numbers), and Devarim (“Words” or Deuteronomy). These books recount the story of the Jews’ enslavement in Egypt, their liberation from Egypt under Moses, their sojourn in the desert, and their eventual return to the promised land, the land of Canaan. The central event of these narratives, the climactic moment in biblical history, is God’s gift of the Torah to the Jewish people at Mount Sinai. The Torah thus accounts for its own origins, and even recounts the death of its traditional author, Moses. Traditionally, these paradoxes are resolved by believing the text to be the literal word of God, dictated to Moses atop Mount Sinai. Besides containing the history of God’s relation with Israel, these five books are interspersed with 613 divine laws (mitzvot, meaning “commandments”). This divine law informs both ethical and ritual behavior, forming the basis of all subsequent Jewish law. In addition to the five books of the Torah, the Hebrew Bible contains two more collections, Nevi’im (“Prophets”) and Ketuvim (“Writings”). Prophets consists of ten books, beginning with the historical narratives of Joshua, Judges, Samuel I-II, and Kings I-II, and concluding with the prophetic oracles of Isaiah, Jeremiah, Ezekiel, and a book of twelve minor prophets. These works span seven centuries, from the conquest of Canaan (c. 1250-1200 BCE) to the exile of the Jewish people to Babylon in the sixth century BCE. The nine books of various genres which make up Writings are Psalms, Proverbs, Job, Megillot (the scrolls containing Song of Songs, Ruth, Lamentations, Ecclesiastes, and Esther), Daniel, Ezra, Nehemiah, and Chronicles I-II. In addition to its poetic and wisdom literature, Writings brings the history of the Jewish people into the fifth century BCE, the period of restoration, when the Jews returned to Jerusalem after their exile in Babylon. The Torah, Nevi’im, and Ketuvim together comprise the Hebrew Scriptures, known by its Hebrew acronym Tanakh. 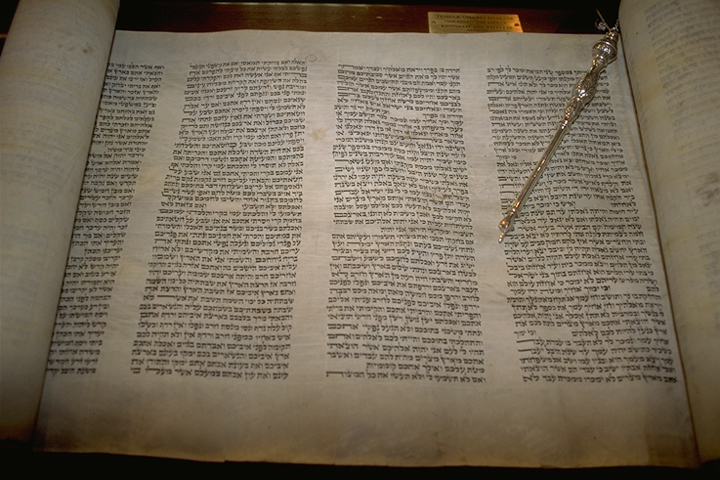 With some revisions and rearrangements, the Tanakh was translated into Greek to become the Septuagint, the basis of the Christian “Old Testament.” It is important to note that the Tanakh and the Old Testament are two different books with slight differences between them, primarily in the order and emphasis of the texts. 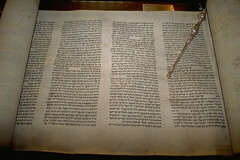 After the final compilation of the Torah, the book of Ezra notes that the first public reading of the text took place in 444 BCE, when Ezra the Scribe instituted the practice in Jerusalem. He also initiated a professional class of specialists in the transcription, illumination, and instruction of Torah. During the Roman empire, these master teachers, now known as “rabbis,” became the leaders of the Jewish community, and their seat of religious learning, the yeshiva, became a central institution of Jewish life. 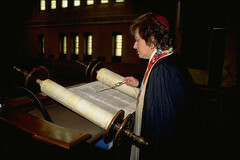 Jews have been reading, studying, and interpreting the text of the Torah ever since. In Jewish communal worship today, the weekly Torah reading is the heart of the synagogue service. 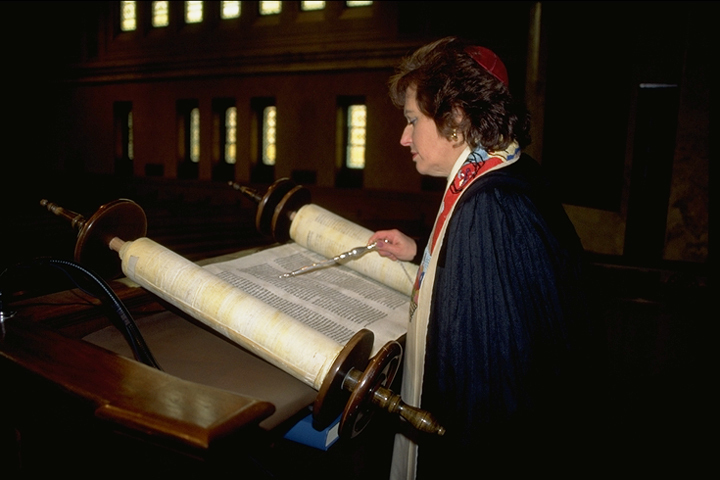 The scrolls of the Torah are kept in the holy ark, often covered with velvet, and when they are taken out to be read, they are lifted for all to see, carried with joy and reverence through the congregation, placed upon the reader’s desk, and unrolled. Then weekly Torah portions are read by members of the congregation. Outside the synagogue, Torah study is an important activity of the Jewish school and home. Since it is considered the direct utterance of God and therefore sacred, study is as important as worship. 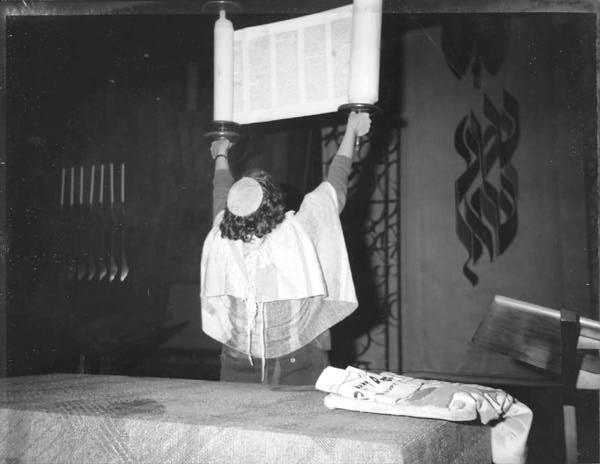 Rather than emphasize their chosenness as God’s priestly people, many contemporary Jews more often esteem the gift of the Torah and the obligation to study as central to the life of their tradition. For some Jews in the modern world, this commitment to study becomes pride in the vitality of intellectual life.